I spent yesterday at a Macro and Close-Up Photography workshop hosted by the Blue Ridge Photography Workshops. It was a cold, gray winter day, and as I packed my equipment in the morning and scraped the snow off my truck, I was glad this lesson was held indoors. As it turned out, the workshop featured a variety of stations with various backdrops, lighting and a huge table set up with props, from toy cars to flowers to bread to colored pencils and old tools. Color and texture abounded! I’ve played with macro photography over the past several years, but seeing all of the many ways you can set up and photograph household items–even with do-it-yourself lighting stations–and get amazing results was quite inspiring. At the end of the day, the instructors held a critique of the day’s work, and it was great to see all of the different ways the students used the props and lighting to make their artistic visions reality. 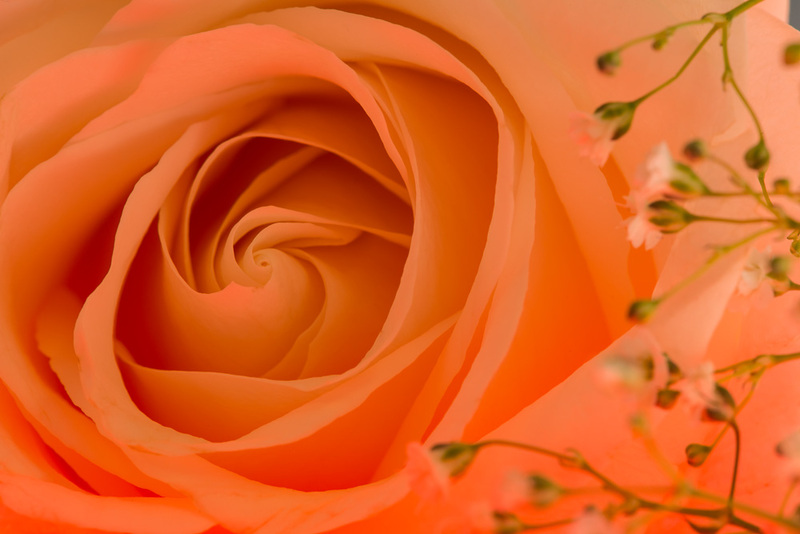 I spent some time with a single white rose laying on a light box and used an orange gel sheet and baby’s breath as accompaniments. This image was shot with a 105 mm lens, 1/4 second at f 29 and edited slightly in Lightroom 4 using the Clarity, Vibrance and Sharpening sliders. Lovely, the day sounds like a true success. Certainly, the flower itself is stunningly captivating. Thank you, Sally. It was a fun day indeed, and any time you can hang out with a group of fellow photographers it’s a bonus! Really, the lens I think was the key. Using a macro lens that allows you to get close to the flower (or other subject) and fine-tune the focus really makes the image look the way it does. I also used a light box, which means the light came from underneath the flower. The orange glow was from a plastic-coated orange colored sheet (see-through) that I placed between the light and the flower. I also used a tripod and release cable to keep the camera as still as possible during the exposure. Hope that helps! What a great day–and your photo is gorgeous! Thanks for bringing forth a little bit of spring to us all. Gorgeous and sounds like you had a wonderful day! Thank you! Yes, it was great to gain more knowledge about close-up photography. There’s more to it than I first thought! I love this Tricia ! Now why wasn’t I there with you??? Probably just a bit from from where I live. How did you use the gel sheet? it really provides just beautiful results.